The essential first step for beginners is to join your local association. There you will find help and advice to get you set up. 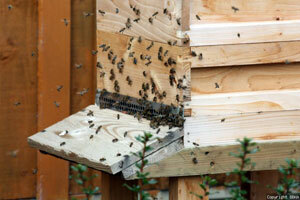 Swarms are, for some beekeepers, the highlight of the beekeeping year. Aimed at those who have never kept bees, but are interested, come and join our taster session. Meet a beekeeper who will explain the kit you will need, show you what an empty hive consists of and even let you handle some bees. Don’t have a bee suit? No problem, we will lend you one. Places are limited so early booking is essential, and it’s free. The session will start at 13.30 on Saturday, 4th May, in Oswestry at The Stonehouse Brewery. Use the ‘Contact Us’ page to book your place. Oswestry Beekeepers’ Association meet throughout the year to bring together Oswestry’s Beekeepers and bee enthusiasts. During the summer months we meet at a different location each time with a different expert guest speaker. During the winter we invite a guest speaker to join us for a talk on a whole range of subjects relating to bees and honey. See our Events page for more information. 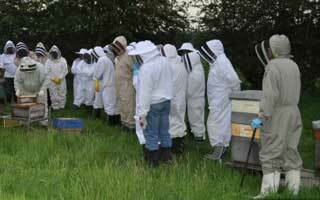 To keep up to date with the latest news on Oswestry Beekeepers’ Association, see the news page. New to beekeeping? 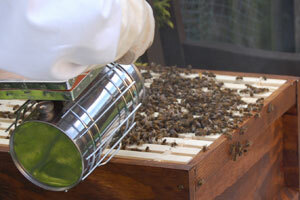 Find out everything you need to know with our beginners’ guide to beekeeping. Oswestry Beekeepers’ Association is a small and informal group of beekeepers based in and around Oswestry. Copyright Oswestry Beekeepers' Association © 2019. All Rights Reserved.